The Tennessee Titans are coming off back-to-back winning seasons for the first time since 2007-2008. However, shortly after an exciting wild card win in Kansas City, Tennessee was dominated by the Super Bowl bound New England Patriots. Heading into training camp in 2018, Titans fans have plenty of reasons for optimism. The team is now under the command of new head coach Mike Vrabel, who hopes he can bring Tennessee their first division title since 2008. Although the AFC South figures to be extremely competitive in 2018, the Titans are a team who posted a 5-1 record within the division a season ago. With general manager Jon Robinson once again busy this offseason, Tennessee will be hoping that the additions they’ve made – most notably on the coaching staff – will provide the fire and culture the Titans need to make a deep playoff run. Will their offense take the next step? While the hiring of Vrabel has sparked a buzz around the team, it’s Vrabel’s hiring of offensive coordinator Matt LaFleur that should have one player particularly excited – quarterback Marcus Mariota. The previous regime seemingly handcuffed the Titans offense by not taking full advantage of Mariota’s legs and the kind of pressure the threat of him running can put on a defense. With teams like the Eagles and Chiefs utilizing run-pass options more and more and seeing more and more success with them, it’s fair to wonder why Mariota was never given such a scheme. Under LaFleur, not only should 2018 bring more of the RPO to the Titans offense, we should expect to see plenty of rollouts and other designs that move the pocket to allow for Mariota’s athleticism and ability to create off schedule to shine. As for Mariota, he remains a quarterback that is difficult to firmly evaluate. Despite injury issues and a limited offensive scheme, since entering the league, Mariota has been on the fringe of being a top quarterback in the league. Recently discussed about the common comparison between Mariota and fellow 2015 NFL Draft top pick Jameis Winston, PFF’s Senior QB Analyst Zac Robinson examined the first two picks of the draft earlier this week. One of the most positive takeaways from Mariota’s 2017 season was how he handled himself in the face of pressure. He finished the year ranked sixth in dropbacks under pressure (29.8 percent), third in adjusted completion percentage under pressure (69.7 percent) and third in passer rating under pressure (82.7). Despite his 15 interceptions, Mariota was one of only two NFL starters last season not to have a single turnover-worthy throw under pressure. He combined that with the sixth-highest big-time throw rate of any quarterback under pressure (7.3 percent) for quite an impressive ratio. LaFleur was the offensive coordinator for the Rams for only a year, but it was certainly an impressive season. The Rams offense finished first in the league in scoring and 10th in total yards. Also, if it’s any indication, LaFleur has been part of the most play-action-heavy teams in the league over the last two seasons. In 2017, the Rams led the league in in play-action pass percentage right at 29 percent. In 2016, the Falcons led the league at a rate of nearly 28 percent. His new quarterback, Mariota, led the NFL in yards per attempt on play-action passes last season (11.1). LaFleur will also be tasked with getting the rest of the offense to perform around Mariota as well. The first wide receiver drafted in the 2017 NFL Draft, there’s no refuting that Corey Davis’ first year as a pro was disappointing. The Western Michigan product finished the season with a 65.3 overall grade (69th in the league) and saw six rookies drafted after him grade out better. It’s no secret that the struggles Davis and the Titan’s offense endured were due, in large part, to a coaching staff with a love of the traditional ground-and-pound game. 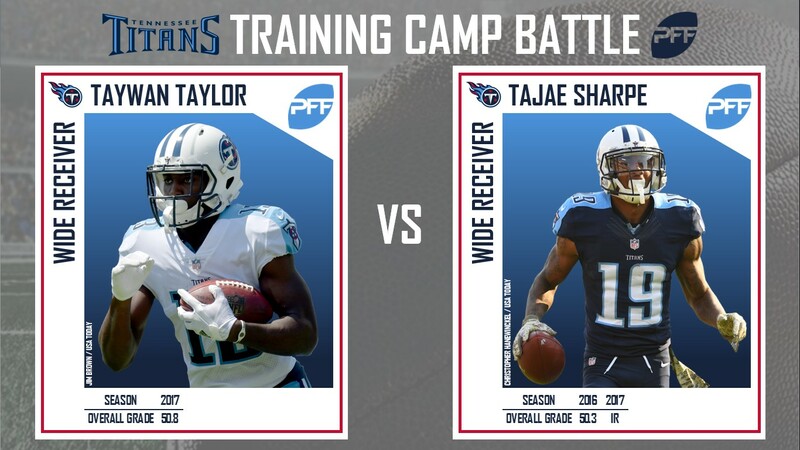 With LaFleur calling the plays, Mariota and Davis – and the rest of the Titan’s passing attack – should see a boost in production. At Western Michigan, Davis graded as one of the 10 best receivers in the nation every year from 2014-2016, much too long of a stretch of elite play to think that his production as a rookie is what we should expect from him moving forward. Who is the No. 1 running back? After serving as the Patriots lead back in 2017, it’s likely that Dion Lewis came to Tennessee knowing he would be relegated to a change-of-pace role behind Derrick Henry. At 5-foot-8, 195 pounds, Lewis has terrific quickness and should be the perfect complement to Henry. This past season, Lewis ranked first in elusive rating (73.2) among running backs with at least 165 attempts, third in yards after contact per attempt (3.17) and tied for fifth in forced missed tackles on the ground (42) across his 180 carries. In the passing game, the difference between Henry and Lewis becomes clear again, as over the last three seasons, Lewis has caught 85 passes for 696 yards, averaging 1.65 yards per route run. Conversely, Henry, over his two-year career, has caught only 24 passes and averaged just 1.08 yards per route run. Tennessee’s 3-4 defense should continue to get solid edge production this season. In 2017, Brian Orakpo and Derrick Morgan combined for 18 sacks, 13 hits and 79 hurries. On the interior of the line, one of the Titan’s highest-graded players, Jurrell Casey (89.7), racked up seven sacks, 15 hits and 32 hurries hits in 2017 – making five straight seasons that he has delivered at least 50 pressures. The Titans enter the year ranked 12th in our pass-rush rankings after finishing 2017 ranked 21st in pressure percentage as a team (33.6 percent). They will be hoping that second-round pick and former Boston College Eagle Harold Landry helps them out off the edge in the pressure department. Despite a disappointing 2017 season, in 2016, Landry was dominant. He finished that year with 18 sacks, seven hits and 44 hurries on his way to 69 total QB pressures and a 17.5 pass-rush productivity rate (first among Power 5 edge defenders). Tennessee will be hoping for immediate production from their first-round pick this season, linebacker Rashaan Evans. Last year at Alabama, Evans finished with an 85.5 overall grade and led the nation in pass-rush productivity among linebackers with a rate of 21.9. He hasn’t played an NFL snap yet and he will have to prove he can hold up in coverage (only two pass breakups and no interceptions in 2017), but based on his speed, athleticism, agility and size, Evans’ ceiling is as high as any linebacker in the draft class. In the secondary, Malcolm Butler joins an already talented group. Prior to last season, Butler was borderline one of the best corners in the game. His accomplishments in 2016 include: a Super Bowl ring, a PFF grade of 88.1 (eighth best among cornerbacks) and 16 combined pass breakups and interceptions (tied for third-most at the position). Unfortunately, in 2017, Butler was not the same player. He allowed a career-high passer rating of 103.3 on throws into his primary coverage while managing to notch just 12 combined pass breakups and interceptions. His season ended with an over grade of 79.2, 51st out of 121 qualifying players at the position. Still, though, Butler is more than capable to start in the NFL and should find a nice home opposite second-year cornerback Adoree’ Jackson. Together, Butler and Jackson could form one of the best playmaking tandems in the league. Jackson is coming off an impressive rookie campaign in which he recorded 15 pass breakups (tied for second most among cornerbacks last year), and Butler has finished the last three regular seasons with at least 10 pass breakups and at least two interceptions – making him one of just three cornerbacks to ever achieve that feat in three consecutive seasons. 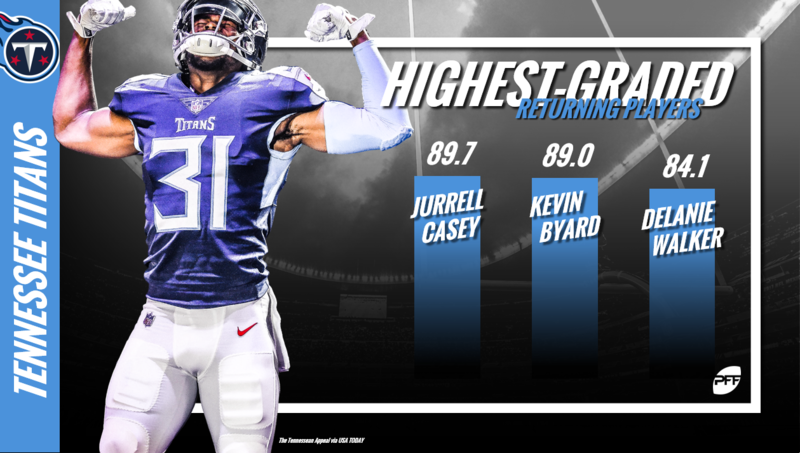 The secondary also features ball-hawking safety Kevin Byard, who led the NFL in interceptions last season (eight). Not only that, but Byard’s 15 combined pass breakups and interceptions in 2017 propelled him into historic company. Only two safeties in the PFF era have produced more PBUs and INTs in one season (2010 – Ed Reed, 16; 2008 – Troy Polamalu, 16). With Johnathan Cyprien locked into the other starting safety position, the Titans field one of the better secondaries in football. If Butler can perform like his 2016 self and if Jackson can make the proverbial ‘second-year jump,’ with Logan Ryan in the slot and Byard roaming the backend, the Titans have the making of their very own “no fly zone” in the AFC South.